Health-care providers are one of the cornerstones of health-care systems, and a sufficient supply of medical professionals is fundamental to the provision of healthcare. The physician “brain drain” which involves physicians' emigration from developing countries with considerable shortages of health-care workers to developed countries has been a pressing issue and considered a potential threat to or crisis for health services in developing countries in recent years. The USA, Canada, the UK, and Australia are the top four destination countries for émigrés from developing or source countries and between 23% and 28% of physicians in these destination countries are international medical graduates. African countries which are also source countries hold only 3% of the total number of health workers in the world but comprise 11% of the world's population. On a domestic level, Lebanon has the highest proportion of medical graduates from a source country working outside their country. This issue not only affects the efficiency of health services but also leads to a loss of source countries' well-educated nationals who are required to lead the process involved in improving health systems to destination countries; in fact, 65% of all health professionals who emigrate are classified as “highly skilled.” The reasons underlying this issue are multiple and varied. For example, in a study conducted in Karachi, Syed et al. found that the quality of educational programs, remuneration, and poor work environments were the main reasons why physicians chose to work abroad. In addition, a study conducted in Ireland showed that facilitation of specialty training pathways, improvements in pay and work environments and the provision of a clear career pathway for trainees could be implemented to address the problem. Saudi Arabia as developing country is also subjected to this global issue. Saudi physicians working in Saudi Arabia percentage is accounted to be 21.5% (n = 14,243) according to Ministry of Health Statistics. This low percentage of Saudi physicians may be affected by the brain drain phenomenon. Therefore, this study aimed to explore the kingdom's current position in terms of intervention policies and the magnitude of the problem. This cross-sectional survey-based study was conducted at Qassim College of Medicine in the Qassim region, Saudi Arabia. The individuals included 150 medical students in their prefinal and final years of college and voluntarily completed a modified version of a questionnaire developed by Akl et al. The questionnaire was translated into Arabic to ensure the understanding of the students. Students were informed that the data would be used for research purposes only and the anonymity of the participants would be conserved. It is also indicated that filling the questionnaire would be considered as acceptance for participation in the study. The permission for distributing the survey was obtained from Qassim College of Medicine ethics committee. We distributed the questionnaire and obtained the results during November 2015. The mean value and standard deviation were calculated for individuals' age, and frequencies and proportions were calculated for all other variables. The relationships between student characteristics and three dependent variables representing students' intention to study abroad were explored. The dependent variables of interest included the intention to study abroad (yes or no), preferred destination country for intended study (Canada, the USA, or other), and whether students intended to return to Saudi Arabia (coded yes or no). However, as few respondents stated that they would remain abroad permanently, it was impossible to distinguish between those who intended to delay their return and those who planned never to return. Univariate analyses including a t-test and an ANOVA were performed to compare age between groups. Other variables were compared using a Chi-square test or Fisher's exact test as appropriate. Intended specialties were recorded as “other” if they were chosen by fewer than 10 subjects to allow comparison. Multivariate analyses included logistic regression models involving backward elimination to identify characteristics associated with intention to study abroad and return to Saudi Arabia following training. In addition, a multinomial logistic regression model was used to analyze preferred destination countries for intended study. All tests were two-sided and P < 0.05 was considered statistically significant. The analyses were performed using Stata 11 MP. The students' characteristics are reported in [Table 1]. Their mean age was 23.3 years and 101 were male students. Most students were single, and few considered themselves of lower socioeconomic status. In addition, most respondents ranked themselves in the middle third of their class in terms of academic performance. Most respondents stated they intended to study abroad. Of the destination countries, Canada was chosen most frequently followed by the USA. In addition, most students stated that they would return to Saudi Arabia immediately following training [Table 2]. The relationship between preferred destination countries and intention to return are various according to countries. The proportion of students with a preference for Canada who stated that they would return home immediately following training was higher (77.1%, n = 37) relative to those observed in students who preferred the USA (45.6%, n = 15) or other countries (53.3%, n = 8), but this difference was not significant. The intention to study abroad differed according to the year of study in medical school. The proportion of prefinal students who intended to study abroad was significantly higher relative to that of final year students [Table 3]. Destination country preference differed according to class ranking, and the proportion of students ranked in the top third of the class who intended to go to Canada was significantly higher relative to that of those ranked in the bottom third of the class. Students with dual citizenship were more likely to express the intention to study in the USA relative to those without dual citizenship. Moreover, male students were slightly more likely to express the intention to study abroad relative to women. However, women were significantly more likely to express the intention to remain abroad following training relative to male students. 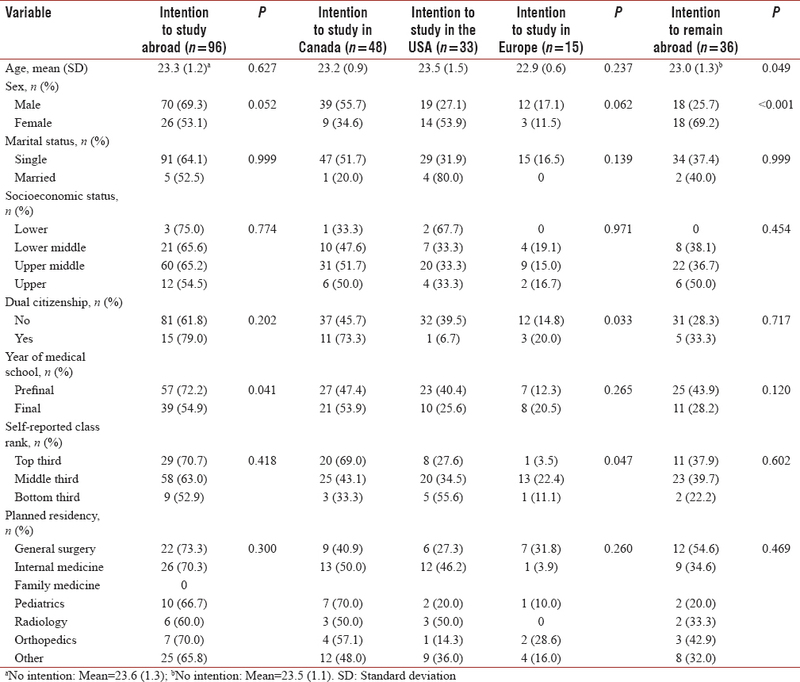 The characteristics independently associated with the intention to study abroad in the multivariate analyses are reported in [Table 4]. 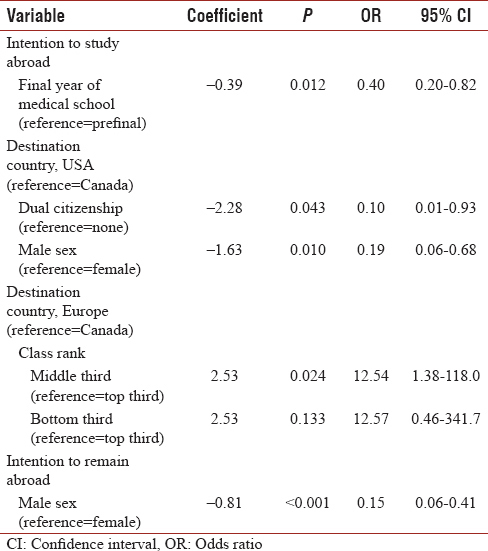 As in the unadjusted analysis, the year of study in medical school was the only factor associated with the intention to study abroad and students in the final year were less likely to express the intention to study abroad relative to those in prefinal years. Male students and students with dual citizenship were more likely to express a preference for studying in the USA, rather than Canada, relative to female students and students without dual citizenship. In addition, class ranking was associated with country preference. Students who ranked lower in class were more likely to express a preference for studying in countries other than Canada relative to those who ranked higher in class. Moreover, the likelihood that male students would remain abroad following training was significantly lower relative to that observed for women. The results showed that almost 70% of male students intended to study abroad but did not intend to remain abroad either for specialty or subspecialty training and most preferred to study in Canada. In contrast, approximately half of the women preferred to study in the USA and almost 70% intended to remain abroad following training. These findings are consistent with those of a study involving Lebanese students which showed that 40% of women intended to study abroad. In addition, according to a study conducted by Akl et al. 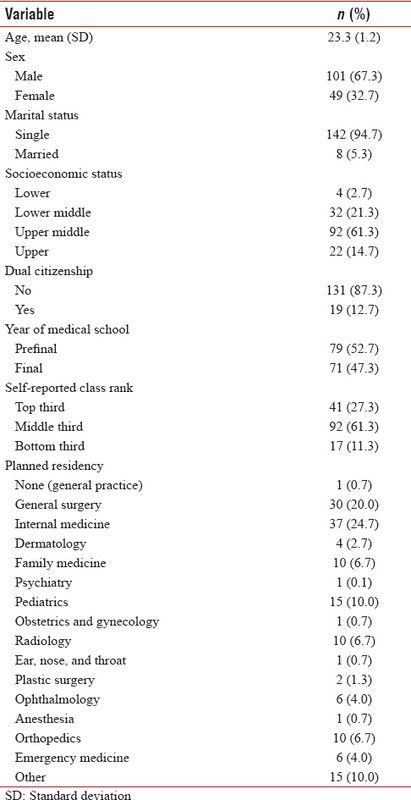 the proportion of female international medical graduates who were practicing physicians (30%) was lower relative to that of their male counterparts. Moreover, the finding that the proportion of women who intended to study abroad was lower relative to that of male students could be attributed to cultural and social issues in Saudi Arabia which put some barriers in front of the woman such as having another person in the family to travel and stay with her abroad which sometimes is unavailable or difficult for that person due to his work. The brain drain phenomenon is not exclusive to Saudi Arabia. A study conducted by Mullan showed that this type of migration occurred on a worldwide scale. In the current study, approximately one-third of individuals did not intend to study abroad. This is consistent with the findings of Akl et al. 's study which showed that the majority (95.5%) of individuals intended to study abroad. Moreover, a survey conducted in India included 166 final-year students showed that 59.0% of individuals had considered training abroad. In one study, 4%, 2.1%, 1%, and 0.8% of medical graduates in Canada originated from the UK, India, Saudi Arabia, and Egypt, respectively. In addition, the current results showed that half and one-third of subjects intended to study in Canada and the USA, respectively. France was one of the less preferable destination countries in the current study. However, the proportion of Lebanese students in Akl et al. 's study who preferred to study in France (12.1%) was higher relative to that of those who preferred to study in Canada (4.2%). In the current study, 62.5% of students who intended to study abroad intended to return to Saudi Arabia immediately following training. However, women expressed a stronger intention to remain abroad following training relative to that observed in male students. In contrast, of the Lebanese students who intended to study abroad in Akl et al. 's study, 25.1% intended to return to Lebanon immediately following training and only 10.6% intended to remain abroad permanently. From students' perspectives, the quality of the training provided was the primary factor in the decision to complete residency training and remain in the destination country permanently. The results also showed that students' marital status affected the decision to study abroad. The proportion of single individuals who intended to study abroad (64.1%) was higher relative to that of married subjects (52.5%). The reason for this finding could be that single students have fewer responsibilities relative to those of married students and therefore find it easier to study abroad. In addition, the cost of studying abroad would be greater for married students relative to that incurred by single students. However, the number of married students included in this study is small in comparison to the single students which make the comparison between the two groups unfair. Unexpectedly, socioeconomic status appeared to present less of a barrier to studying abroad for students of lower socioeconomic status. The proportion of these students (75%) who intended to study abroad was higher relative to that of students of upper and middle socioeconomic status 65.2%. The reason for this finding could be that many Saudi students benefit from scholarships offered by hospitals and universities in Saudi Arabia. In addition, students of lower socioeconomic status tend to go abroad to study and seek well-paying jobs on returning home. The academic level has also an effect in the decision in going outside for training. In this study, the highest percentage of those intending to migrate was found in those with highest academic achievement. That is expected because the highest achievers will most likely be more equipped to perform better in the licensing examinations such as the United States Medical Licensing Examination and other examinations which are mandatory for acceptance in outside training; therefore, they have a higher chance of migrating. The brain drain could have serious negative consequences for the quality of health-care services in Saudi Arabia. Moreover, it has implications for both policy and future research. This migration is associated with educational investment with uncertain return and a loss of intellectual capital. In fact, a number of high-income countries endeavor to address their own physician shortages by recruiting individuals from the pool of English-speaking international medical graduates targeted by the United States. These countries could benefit financially from remittances, the transfer of skills and potential investment on migrants' return. However, the source could also experience the disadvantages of a brain drain, resulting in the loss of educational investment and intellectual capital, a reduction in the range of services available and chronic staff shortages in healthcare. In Saudi Arabia, some sponsoring agencies such as the universities are trying to reduce the negative outcome of abroad training by contracting the trainees that they will return to the source country and work there after finishing their training abroad. However, this is not the situation in all governmental agencies who grant the trainees. The study was subject to some limitations. For example, it included students from only one medical college. Therefore, the results might not be generalizable to students from other institutions. Moreover, small numbers of included subject in this study limited the comparisons between the study groups and the comparison with other studies. Most of our individuals intended to study abroad and the destination mainly the USA and Canada. Although Saudi healthcare system experiences a shortage of physicians, some subjects preferred to remain abroad following training. This intention was varied according to gender differences. Therefore, this phenomenon could affect both source countries and destination countries. To identify the dimensions of this phenomenon and its effects on health-care systems, patient care, and physicians' lives further research should be conducted. Gouda P, Kitt K, Evans DS, Goggin D, McGrath D, Last J, et al. Ireland's medical brain drain: Migration intentions of Irish medical students. Hum Resour Health 2015;13:11. Imran N, Azeem Z, Haider II, Amjad N, Bhatti MR. Brain drain: Post graduation migration intentions and the influencing factors among medical graduates from Lahore, Pakistan. BMC Res Notes 2011;4:417. Arah OA. The metrics and correlates of physician migration from Africa. BMC Public Health 2007;7:83. Akl EA, Maroun N, Major S, Afif C, Abdo A, Choucair J, et al. Post-graduation migration intentions of students of Lebanese medical schools: A survey study. BMC Public Health 2008;8:191. Stilwell B, Diallo K, Zurn P, Dal Poz MR, Adams O, Buchan J, et al. Developing evidence-based ethical policies on the migration of health workers: Conceptual and practical challenges. Hum Resour Health 2003;1:8. Syed NA, Khimani F, Andrades M, Ali SK, Paul R. Reasons for migration among medical students from Karachi. Med Educ 2008;42:61-8. Akl EA, Mustafa R, Bdair F, Schünemann HJ. The United States physician workforce and international medical graduates: Trends and characteristics. J Gen Intern Med 2007;22:264-8. Mullan F. The metrics of the physician brain drain. N Engl J Med 2005;353:1810-8. Rao NR, Rao UK, Cooper RA. Indian medical students' views on immigration for training and practice. Acad Med 2006;81:185-8. Moore J, Gale J, Dew K, Simmers D. Student debt amongst junior doctors in New Zealand; Part 2: Effects on intentions and workforce. N Z Med J 2006;119:U1854. Regets MC. Research and Policy Issues in High-Skilled International Migration: A Perspective with Data from the United States. IZA Discussion Paper No. 366. Arlington (VA): National Science Foundation; 2001. Adams O, Kinnon C. A public health perspective. In: International Trade in Health Services: A Developmental Perspective. Geneva: UNCTAD-WHO; 1998.